Nowadays Instagram is too popular not to be recognized by millions of people from all over the world. iPhone, iPad and iPod Touch users go mad over supplemental apps for this service. And they are right! Because the idea of taking photos, editing and sharing them via social networks is so incredible and alluring that you can’t stay aside. Several years ago (up to 10, I guess) your cellphone was just a phone and now it’s a phone, a camera, a media player and a computer – all in one small device. That’s fantastic! So you should be ready to go with the times and track the latest trends of IT world. Are you ready to go? We’ve gathered 26 popular apps for Instagram which will help you to make your photos even better. All of the apps are distributed via the Apple Store for free or for a low fee. Also here you’ll find some awesome websites which will enrich your Instagram collection with new functionality and almost unlimited opportunities. Since we’re going to talk about Instagram apps, it would be better to download and instal the main app itself (in case you still don’t have it). 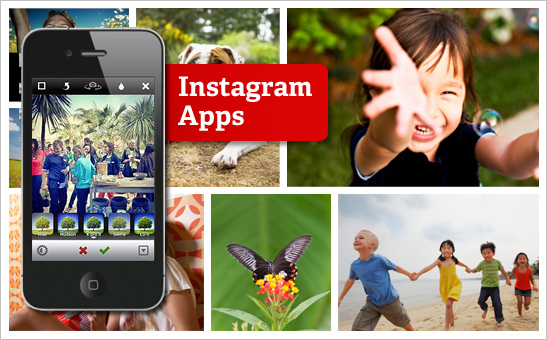 Over 15 million users are sure that Instagram is a fun and convenient way to take, edit and share photos. If you’re a lucky owner of the iPhone you are welcome to have some fun with Instagram. The Android version of the app has also been released. This free service lets you enjoy your Instagram and Pinterest photo streams at once. You can pin photos to these social networks and comment them, but you are not able to take photos. This app was exclusively created for iPad users, so if you have one you can test it right now. If you miss some places in the world you can always look at photos from there using this simple photo app. Adjust desired location on the map and enjoy photos taken from and around that place. If you want to please someone who’s far away from you then this photography application is a real godsend. 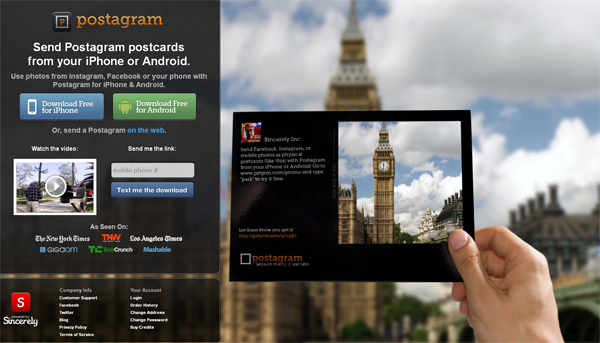 It allows to choose a photo from your iPhone library, Instagram or Facebook, to arrange it like a real postcard, and order its printing and delivering to your addressee for 99¢ only. If you’re a blogger or just one Instagram-maniac with an obsessional idea of ‘liking’ all photos on Instagram and following all their authors then use this web photo app right now. Your account on the Followgram will save all information about your friends, followers and galleries. 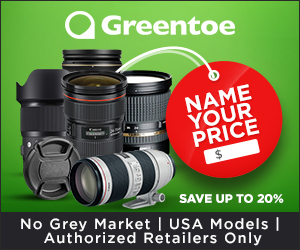 This site allows users to share their stylish and fashionable looks. It’s a growing community for men and women of fashion as well as for companies and brands. 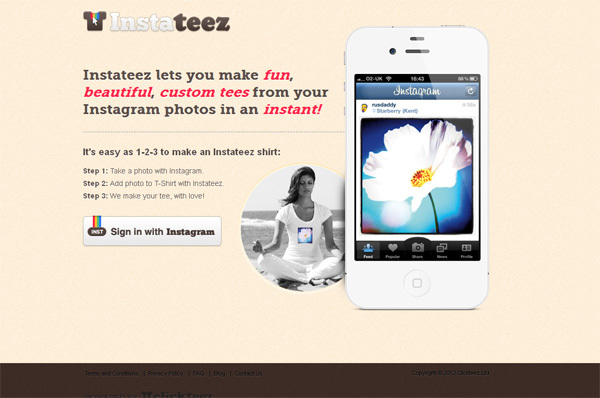 Instateez is a simple way to choose photos from your Instagram and to make a real T-Shirt. Once you have your design on a shirt you can buy and share it with your friends on Facebook, Twitter, Google+, Tumblr, or via email. 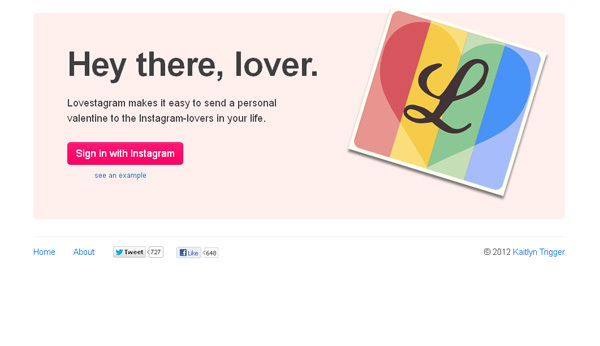 This awesome photo app was created by the girlfriend of the Instagram co-founder on St. Valentine’s eve. 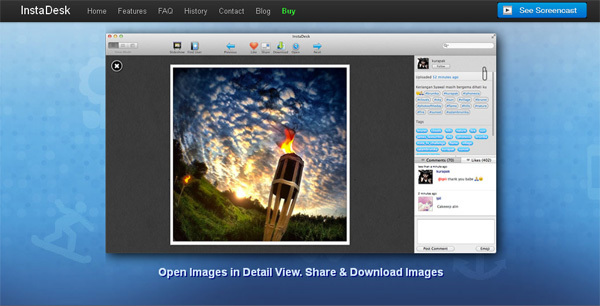 The app creates an ecard with photos shared between you and your partner (a loved one, a friend or even a co-worker). It’s possible to arrange pictures in a slideshow or to combine them into a collage in one frame. Do you have many friends on Instagram? 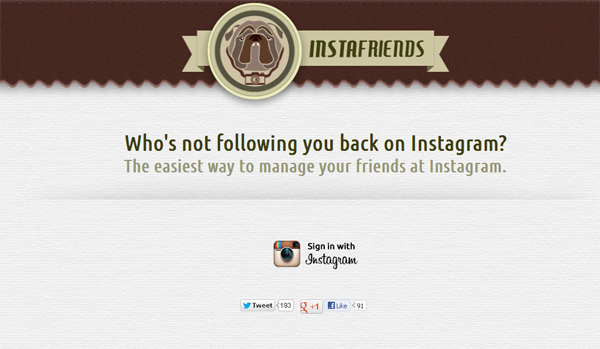 InstaFriends is a website which will help you manage your friends list. Do you know which of your followers don’t follow you back? It’s easy to find out! 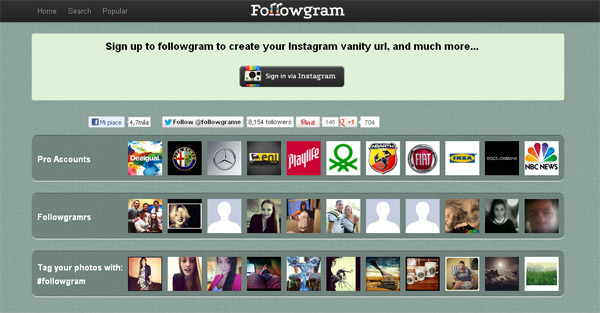 Sign in with Instagram and monitor lists of your followers. 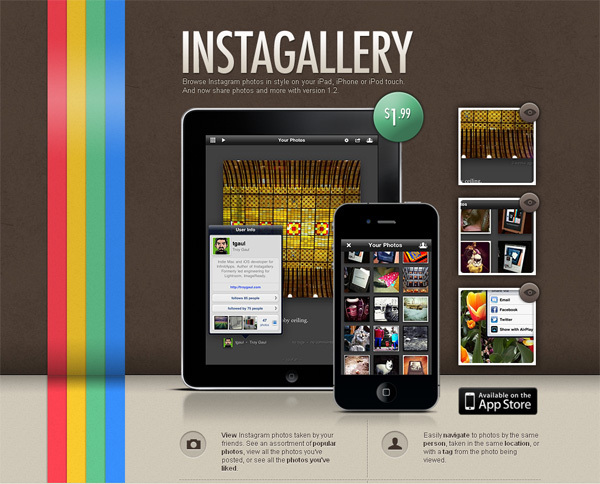 This free photo app for iPhone and iPad was created for photo fans which track all the popular trends on Instagram. This app displays the current time on your smartphone using pictures from Instagram “Popular” feed. It looks very cool, so you may be sure you attract attention of people around you. 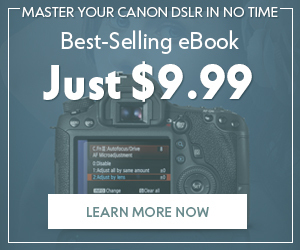 Want some photos from Instagram to be with you all the time? It’s very easy. 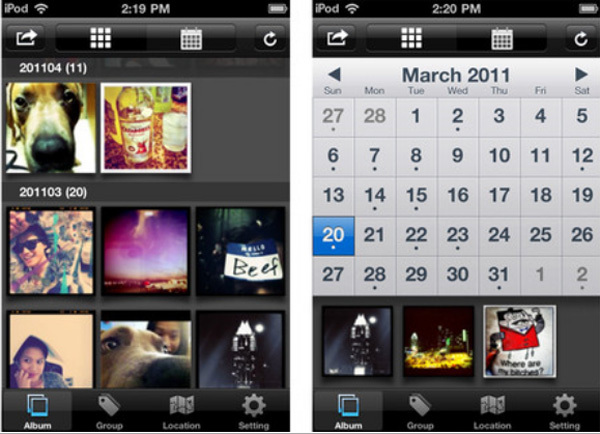 Save images from Instagram in your camera roll and enjoy them. 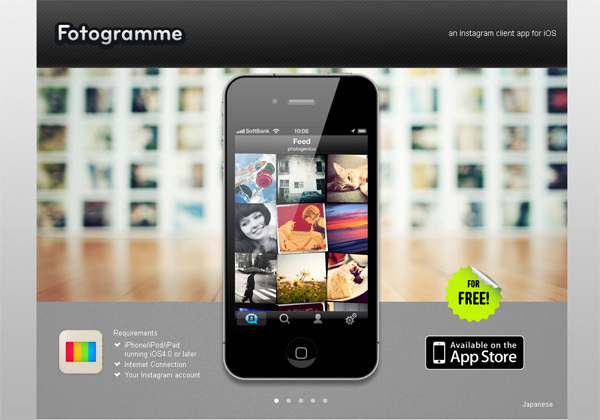 Fotogramme is a free to use Instagram client. It’s a good tool for browsing through images which have already been published on Instagram and for viewing users’ profiles information. 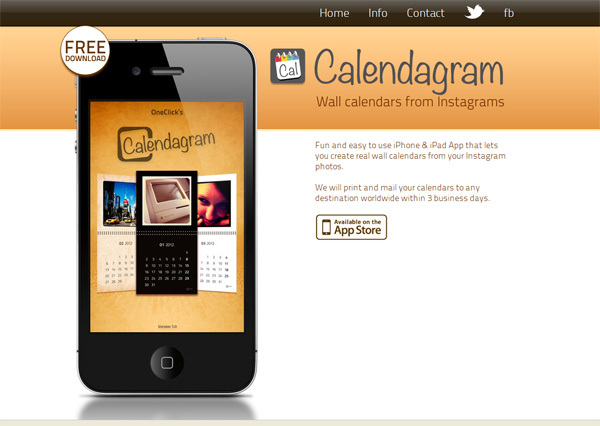 Want to have a wall calendar with your Instagram photos? 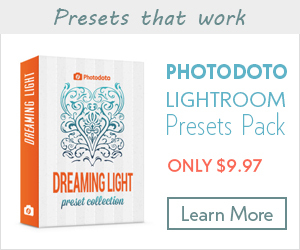 Ok, then choose 12 photos from your or your friends’ collection and enter a delivery address. A high quality wall calendar will be delivered to you within 15 business days. You like Miami but at the moment you have to be in Alaska? InstaRadar will show you all the points of interest of any place in the world. 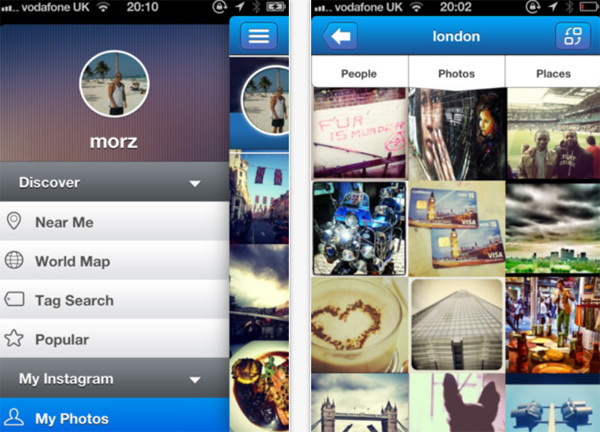 This app will show you all Instagram pictures from your favorite places on the planet. 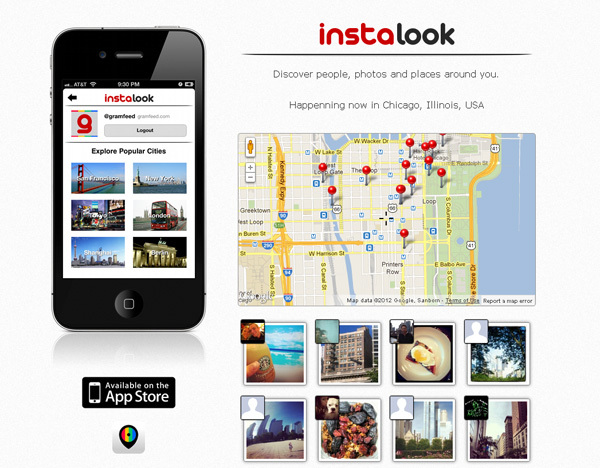 Instalook is another photo app which searches Instargram based on geo data. 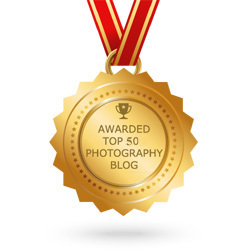 It shows you photos which were recently taken around your location and allows to follow their authors. It’s a good chance to find new friends everywhere. PicFrame can easily edit your images, combine them into frames and share via Facebook, email, Instagram, Twitter, Flickr and Tumblr. By the way, do you know that this app was mentioned in the list of top 5 iPhone paid photography apps? 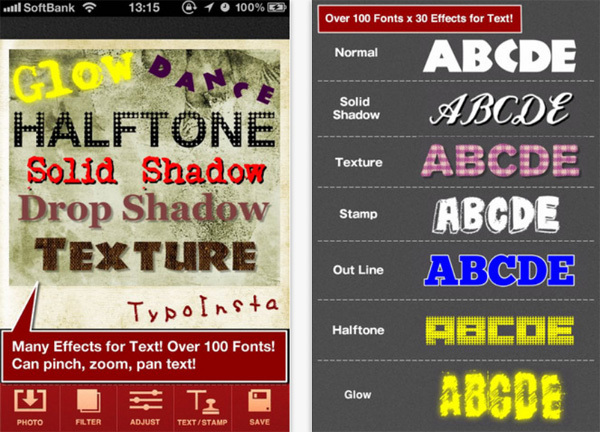 This charming app which was designed specifically for iPhone and iPad can make your device look extremely gorgeous. It arranges and displays Instagram photos (yours, your followers’ picture or the most popular photos on Instagram) into a slideshow mode. 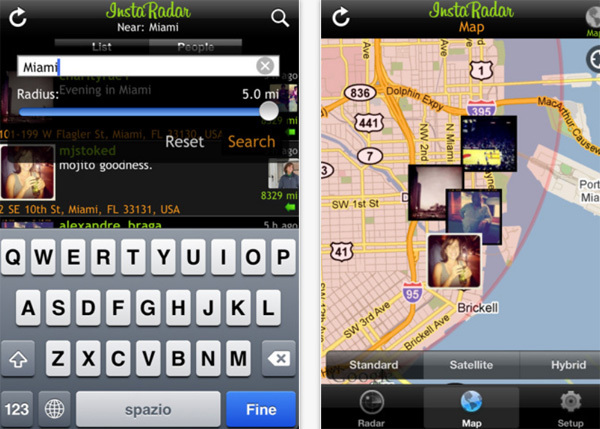 Yeah, it’s another app which searches and displays images depending on your geo location. But using this magic photo app you can also view popular Instagram photos, photos of some users or photos with some tags. There are two modes to view images: in a tile view or pinned to a map. That’s amazing! Are you a gambler? 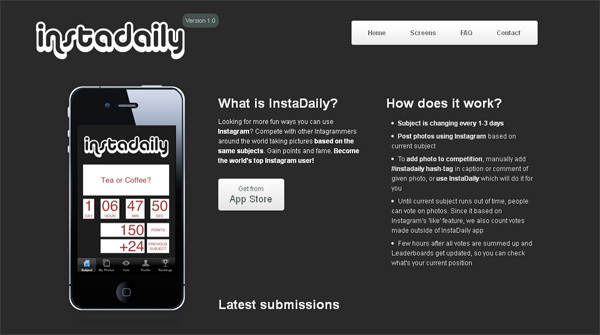 This photo app will bring you into the world of new contests every 1 – 3 days. 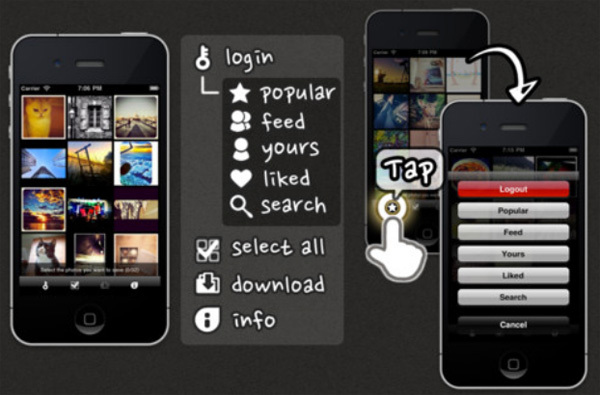 The app offers you a topic of the current contest and displays your photos’ positions. Want to know what the prize is? Download the app, try to win and tell us about your success. 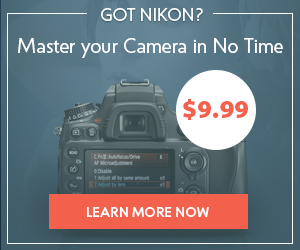 Do you have many Instagram photos? To track all of them you probably need an Instagram client. 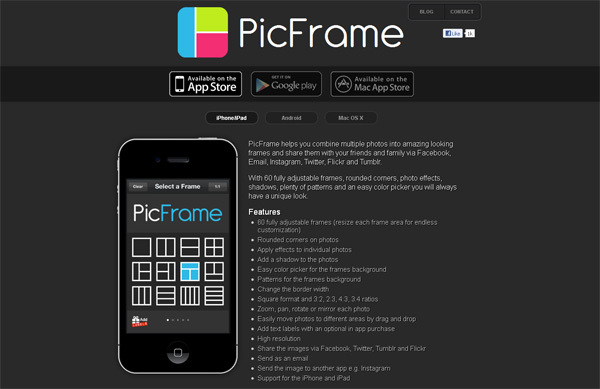 This app is similar to Fotogramme but it has an extended functionality. Using this tool you can arrange your pictures in different ways (grid view, calendar view, map view) and share them on different social media networks. 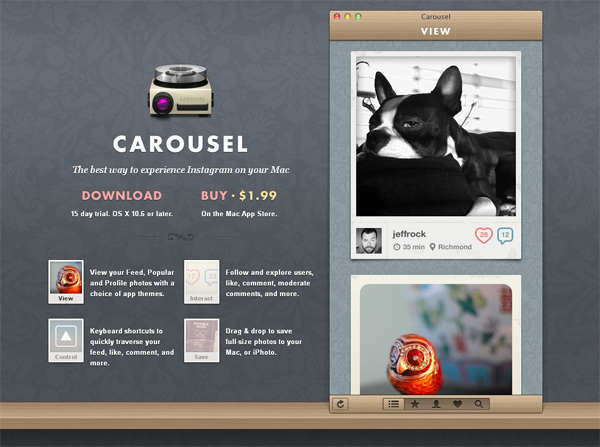 Carousel is a great way to experience Instagram on your Mac. Do you have an Instagram account? If no, create it and enjoy photos from Instagram in a minimal footprint. 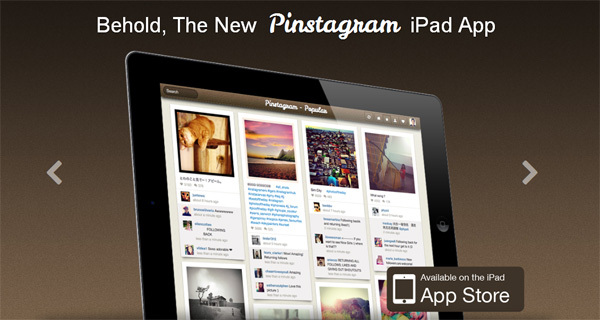 It’s a beautiful Instagram client for iPhone, iPad and iPod. The app is good for managing photos and communicating with your Instagram community. 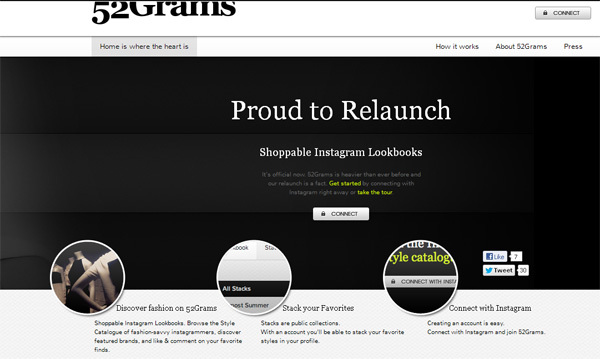 Note that to access the app you need to have an Instagram account (in case you use Instagram app you already have one). 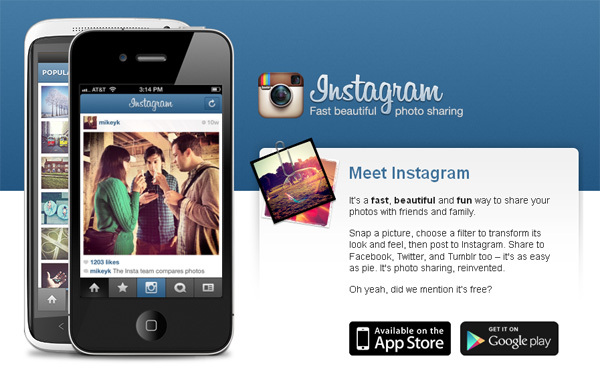 As you can see from the title of the app it was created to add different typos on Instagram photos. This app also has interesting frames and labels to apply. After all it’s possible to post pictures on Facebook or Twitter. 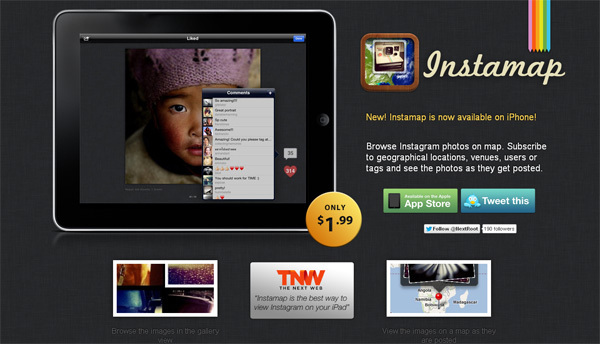 This app was created for iPad and Instagram fans. 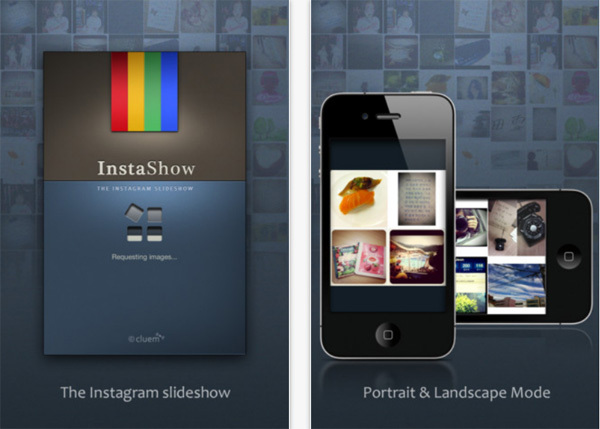 If you have to wait for a long time you’ll probably be interested in this photo app. 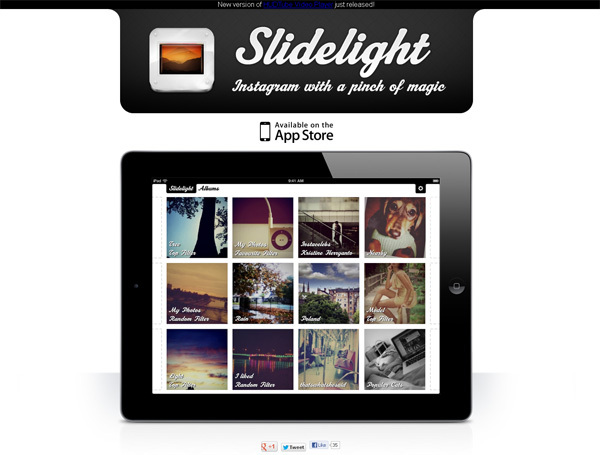 Slightlight showcases millions of photos in a slideshow mode. You can choose photos to look through by some criteria: by topics, by location, by authors, etc. Surely Instagram is an app for mobile devices only, but you can also be on the stream when using your Mac. Manage your Instagram account, arrange your albums, like new photos and comment on them, find friends and interesting people to follow using this fantastic Instagram client for Mac. Do you like magnets? 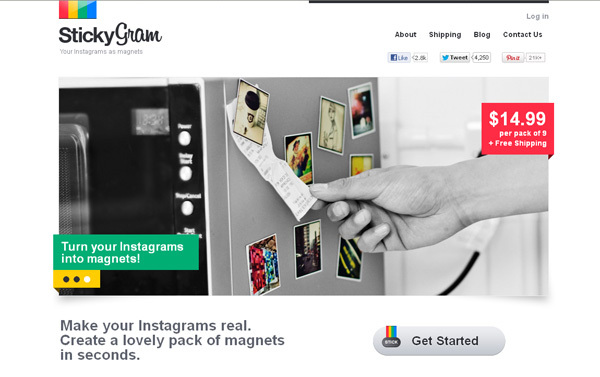 This small smart app promises to create a lovely pack of magnets with your Instagram photos and to deliver it to you wherever you are. Now you’re familiar with the most popular Instagram apps and you can choose the best ones for your iPhone, iPad, iPod touch or PC. We apologize if we missed some of your favorite photo apps. You can suggest other apps to be included into this list in case you think they will be interesting for Instagram geeks like you. So enjoy the collection and have a good time with it!